We had a recent camping holiday in the North Western area of Brittany - the area is called Finistère (Finis - Terre - or "end of the world"). Just like Lands End in Cornwall ! It is an area of coves and inlets and lovely white beaches. We had chosen to go to this area as it was our first expedition to France with our dog and we didnt want to take her to an area where temperatures would be too high. Mind you with Summer 2012 I think we would have been safe to go anywhere ! We had visited this area in the past and were looking forward to exploring it again. In fact we didn't travel very far and enjoyed numerous dog walks and coastal walks around Carantec, Roscoff and on the Ile de Batz and Ile Caillot. 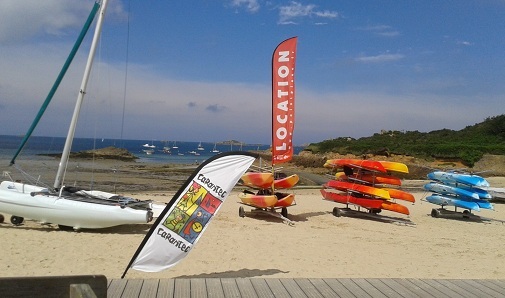 Carantec has at least two lovely sandy beaches including the Plage du Kelenn main beach, which has some pizza/creperie restaurants overlooqking it. if the tide is in, and you are brave enough then you can dive in from the diving board into the clear blue sea. You can also hire a beach hut, something I have always wanted to do ! There is a sailing school, which runs classes in a weekly basis during the main French school holiday period, early July to late August. Children can learn to sail a dinghy or a catamaran. If you want to take advantage of this, it is probably better to book in advance as it can get booked up for certain weeks. A market takes place in Carantec each Thursday morning and has some excellent local produce from the local organic farm as well as some great fish and shellfish that has been caught locally. To get around during the French school holidays (early July and August), a free bus service runs in the town. The GR34 coastal walk goes around the Carantec coast, along the cliffs, past the beaches and beautiful holiday houses and then on past the oyster farms and the Prat Ar-Coum oyster and seafood sellers. Ile Caillot has a small chapel and some lovely beaches. However if you are going to make the crossing please ensure you have the tide times or preferably go on an organised walk ! The tide times are displayed at the start of the causeway. The granite walls of Roscoff have stood here for centuries, welcoming seafarers. It was at this port that the young Marie Stuart arrived at the age of 6 to become Queen of Scotland and France. You may recognise her more commonly as " Mary Queen of Scots"! 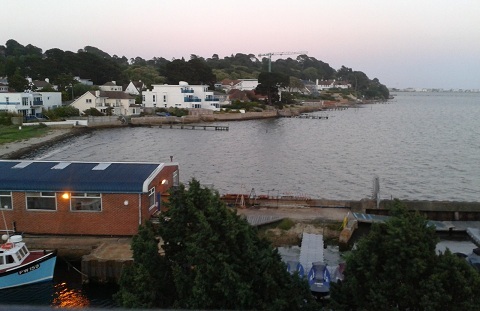 We ate in the lovely Marie Stuart restaurant, which you will find near the seafront. The fishing harbour is backed by some streets with lovely shops and restaurants. 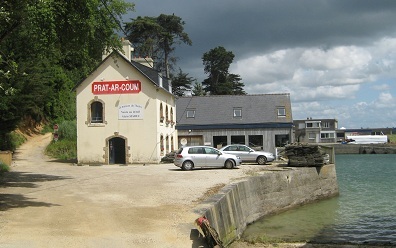 You can take a ferry to the lovely Island of Ile de batz. The main ferry port for the Brittany ferries ships is set slightly round from the fishing port and pier at the more modern ferry terminal and the new marina that opened in 2012. Take the ferry to this island from Roscoff. The island has some lovely beaches, houses and farms where you will see onions growing and the potatoes which are hand picked in the fields. The ferry service runs half hourly during the summer months and you can hire a bike once you are on the island. There are some creperies and cafes on the island. The ferry takes dogs. About five miles from the open sea, at the head of the winding river Morlaix, you will find the ancient, medieval town of Morlaix, which is dominated by the high and dramatic viaduct which arches over the town.. It has a marina that is in a locked basin. There are cobbled streets, boats and yachts, numerous shops, half timbered houses, cafes etc. which all make an interesting day out. You can walk over the viaduct (not right along the top, about half way up there is a perfectly safe walkway). Our favourite shop here is the patisserie which we found listed in the petit fute. This is a very nice town based around the cathedral. Our favourite shop here is the bookshop "Livres in Room" which has a good selection of books, as well as a small section of English books. However,what sets it apart from a normal bookshop is the lovely Salon de the serving all sorts of teas, (coffees, chocolate and juice too!) as well as lovely cakes and flans. You can sit out in the tea garden as well. There is a voie verte green cycle route which runs between Morlaix and Roscoff. It is part of a wider network of routes. However, the section which can be joined fairly near the Les Mouettes campsite and runs to Roscoff (about 11 miles ?) is apparently off road on an old railway route. The weather was too wet the day we planned to try this. However we had seen the sign for it at the road very near to the entrance to a campsite and a shop selling local produce. However please take care as this is a very fast road to cross. 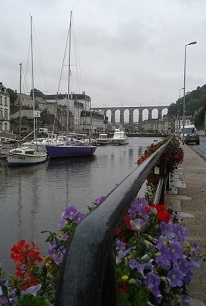 From Morlaix, you can join the route if you park the car adjacent to the yacht marina/harbour and you wil see signs to join the route about 500metres downriver from the viaduct. On our recent camping holiday to Brittany we walked some of the Breton coastal footpath GR34. This was a well laid out, easy to follow stretch of footpath which offered great coastal views. The Breton coastline of sea inlets, coves and cliffs is particularly stunning and makes for interesting walking. The whole GR34 route would take you over 1000 miles right around the coast of Brittany and is predicted to take about 10 weeks, but thankfully you can chose to walk just part of the way ! Depending on where you are holidaying in France, you can see if there are any routes near you. France has a national network of long-distance footpaths or hiking trails, which are known as "Sentiers de grande randonnée". The 35,000 km of marked and signposted footpaths that make up the main network are designated by the letters GR followed by a number. More locally, you will find local hiking routes which are designated as PR paths or "Chemins de petite randonnée". GR routes are marked (on trees, posts, stones, etc) by a short red band above a white band. PR routes are marked with a yellow band. If you see the marks making a cross shape then you have veered off onto the wrong route ! Most of the major long-distance trails run through villages so if you are hiking the whole route, then you will be able to plan for overnight stops in accommodation such as bed and breakfasts, "gîtes d'étape" (rather like small hostels), campsites or small hotels. GR2 - From Le Havre, via Paris, to Dijon. GR4 - The Alps-Atlantic trail: from Grasse, in the Alps, to Royan, on the Gironde estuary. GR6 - The Aquitaine-Alps trail, from Ste. Foy la Grande, near Bordeaux, to Saint-Paul-sur-Ubaye. GR10 - The High Pyrenean trail, following the line of the Spanish border. GR 34 - The Breton coastal footpath, from Vitré to Quimperlé. GR 36 - The 1000 kilometre trail, from the Channel coast to the Spanish border. GR 37 - The central Brittany footpath, from Vitré to Douarnenez. GR 39 - The Trans-Brittany trail, from Mont St. Michel to Guérande. GR 59 - The Jura and Bugey trail, from the Vosges to Grenoble. GR 65 - The Santiago de Compostella pilgrimage route, from Le Puy en Velay, via Conques, to the Pyrenees. GR 223 - The Cotentin and Normandy beaches trail. GR 700 - Regordane Way - historic pilgrimage route from Le Puy en Velay to St. Gilles du Gard. http://www.ffrandonnee.fr/ - The Fédération Française de la Randonnée Pédestre is an excellent source of information about hiking and walks in France. The Federation represents over 3,000 local hiking clubs and aims to promote hiking. To find a map of walks in the area of France you are going then you can search on Amazon, starting with "carte de randonnees" and you should begin to find some maps. Plesae let us know if you have any other links which walkers would find useful and which we could list here ! 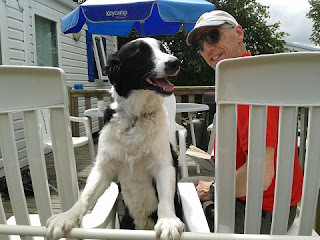 We are just back from a camping holiday in Brittany in France and this time we took our dog with us! It all went pretty smoothly! Although, I must admit there was more planning went into making sure we had the dog organised than there was for making sure the rest of us were organised ! However it all went well and we enjoyed our holiday. 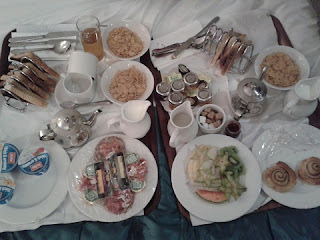 We had to leave the hotel at 5.30 to get to the ferry on time but look at this fabulous Continental breakfast which was delivered to our room. What a great start to a day ! Anyway, the outward crossing went well and she was perfectly happy when we returned to the car. We then journeyed to our campsite Book a Holiday at Les Mouettes Campsite with Eurocampat Carantec in Brittany (this is an affiliate marketing link). En route (that's French !) we were able to stop at some motorway "stopover aires" - open spaces with toilet areas and grassy picnic areas - ideal for a quick dog exercise and toilet stop. Here she is settled in at the campsite ! The campsite was pretty good for dogs - we had chosen to have decking at our mobile home and we had requested a stair gate which we were able to put across the entrance to the decking. We had asked to be put in a fairly out of the way spot to avoid too many passing people. 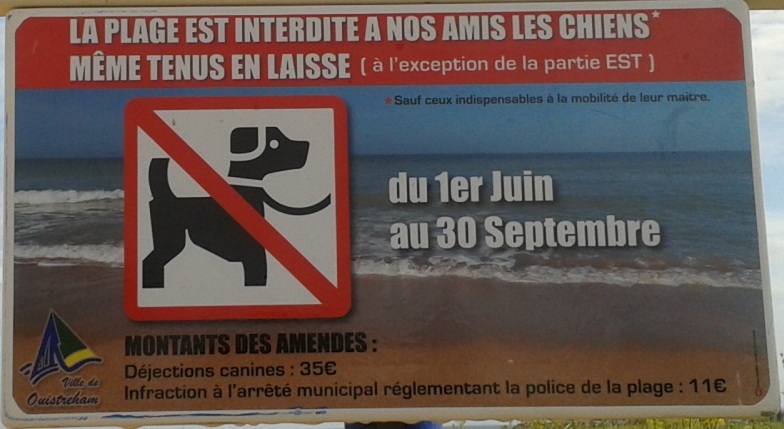 Dogs are not generally allowed on tourist beaches in France, but near this campsite there was a small beach and country road area and as it wasn't apparently classed officially as a proper "tourist" beach then dogs could be exercised on it. Obviously we took her to the far end well away from holidaymakers at the end nearer the campsite. However this walk made a nice end to the evening each day. And on the campsite itself, dogs were made welcome. She was able to sit with us in the bar or on the terrace. She was well behaved and sat quietly. There were a few other dogs on the campsite and we met those as well, including two lovely French Shetland Sheepdogs - 3 year old Nina and her 1 year old toyboy husband ! We were even able to take her into a restaurant in nearby Roscoff at one point - the excellent Marie Stuart Restaurant in Roscoff (named after Mary Queen of Scotland and France who left from Roscoff as a young girl). I don't know how widespread this would be but certainly when the weather is sunny there should be no problem sitting in pavement cafes. There were plenty of walks around Carantec. There is a coastal path which goes right around the town and in fact the whole peninsula and this offers some lovely views. 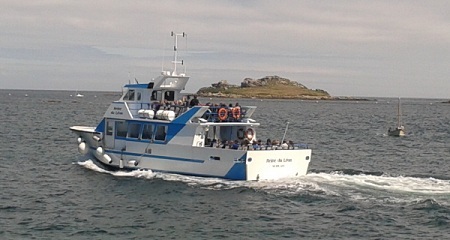 On another day we took the short ferry crossing from Roscoff to Ile de Batz and again that is great for walking dogs. 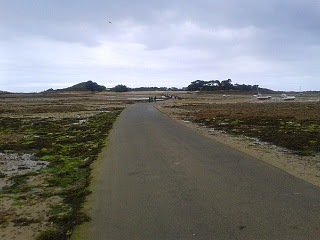 If you enjoy cycling with your dog, there is a stretch of Voie Verte green cycle route not far from the campsite which takes you into Roscoff (about 11 miles) - I believe it is off-road but as the weather was too mixed when we were on holiday we never got round to trying this. 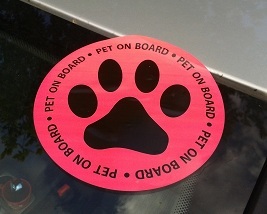 A Pet Passport requirement is that you must visit the vet between 1 and 5 days before you return to the UK. The vet must give them a tapeworm worming tablet. 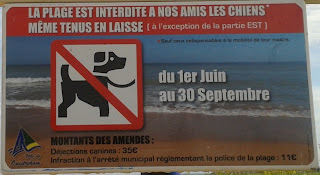 We had booked beforehand with the Feydy Veterinary Practise in St Pol du Leon, about 5 miles from Les Mouettes campsite. She was given a Milbemax worming tablet, the microchip was scanned and the Pet Passport was stamped. We found them to be a very nice vets practise. Thanks to them ! The only problem in our whole holiday planning came from the fact that we got a message half way through the holiday to say that our return ferry trip had been cancelled due to technical difficulties. Brittany Ferries thankfully moved us to the only other possible crossing from Normandy on the day we were due to travel, which was the other fast ferry crossing from Caen (Ouistreham) to Portsmouth. Our final campsite stop was at the lovely Chateaux Lez Eaux campsite near St Pair Sur Mer in Normandy (this is an affiliate marketing link). Chateaux Lez Eaux is a lovely campsite in spacious, green grounds. There was an area where they said we could exercise the dog and also the long driveway was fine for a quick morning walk. We were able to take her into the bar that evening, when there was an excellent Celtic band playing music from the lands of the Celts - Brittany, Ireland, Cornwall, Wales and Scotland. Great fun ! The Bar is very nice - cosy and snug. With the weather we had that evening (early summer? 2012), we could have been in the Highlands of Scotland ! From Chateaux Les Eaux it is approximately an hours drive to either Caen or Cherbourg Ferry terminals. We had been changed to the Caen (Ouistreham) crossing with the Normandie Express ferry. The crossing was due to be a 3.5 hour crossing but due to the weather, it ended up as a 4 and a quarter hour crossing. So that was definitely the upper limit of how long our dog could possibly spend in a car. However I must admit she had had a good spot of exercise beforehand as we walked her just near the end of the beach at Ouistreham - just round from the ferry terminus, and she had also got out while we were waiting for the ferry so she had had chances to stretch her legs before the trip. We made sure she would be comfortable in the car by leaving plenty of water on board and we didn't feed her beforehand just in case she was sick on the crossing. This worked fine for us as she is not normally fed until lunchtime anyway so her meal was just a little later than normal. In fact she was fine when we returned to the car and didnt seem to mind the crossing - unlike a few other members of our party ! We discovered why these fast ferry crossings have the rather unpleasant nickname "Vomit Comets!" So overall, it was a successful and enjoyable holiday. For crossing the channel, the simplest option to consider must be the Eurotunnel Le Shuttle service which is only 35 minutes and you can keep your dog with you in your car. Or take a Dover to Calais crossing which would be a shorter time. However those of us travelling from Scotland, West or SW of England or North of England will probably still find the Poole to Cherbourg crossing to be a good option. So, overall would we do this again - the answer is YES ! and finally of the two teenagers and one other child and the dog who we had on the trip - who do you think was the easiest to entertain and best behaved ? - yes you got it in one ! - THE DOG ! !